Are you a planner and super organized and know exactly how each day will go? I am NOT a planner or an organizer; I tend to be more “big picture” and “spontaneous” when it comes to planning. I tend to think of things in terms of routines and practices rather than schedules and to-do lists. Sometimes, I wish I were more organized and scheduled and planned, but things are as they are, right? Maybe it’s just that I’m more flexible and adaptive. I have been experimenting with different ways to plan or design my days. Maybe it’s because I’m a teacher, but I love planners and office supplies and pens and fancy paper clips (and not so fancy ones, too). I have a collection of colored pens and markers. I even have a box of 64 Crayola crayons! I print off planner stickers. I have FOUR planners: one is for the “everyday” things; one is to track my daily Bible study and to keep prayer requests; a third one tracks my blog entries, and the fourth one is work-related to keep my class schedule and related meetings and tasks. When I started getting serious about planners and calendars, I found out that there are more ways to skin the planner cat than one. 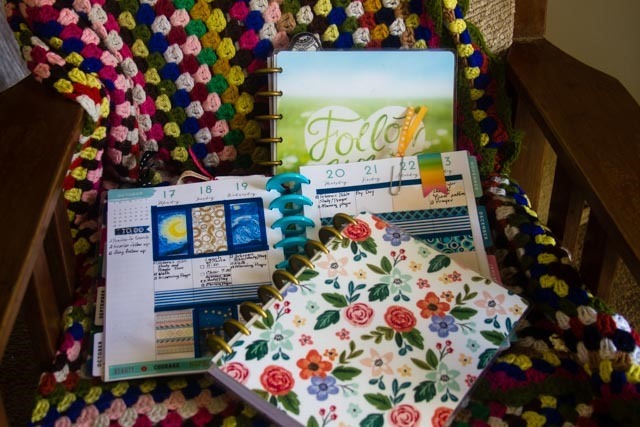 There’s “Right Brain Planning” (Teresa Robinson is the guru), Fauxbonici planning (based on the Japanese system of Hobonici planniing); bullet journaling, and “creative” planning. There are systems that invite you to set your goals for the day, week, month, year, five years, ten years, and life; there are systems that include appointment calendars and to-do lists. 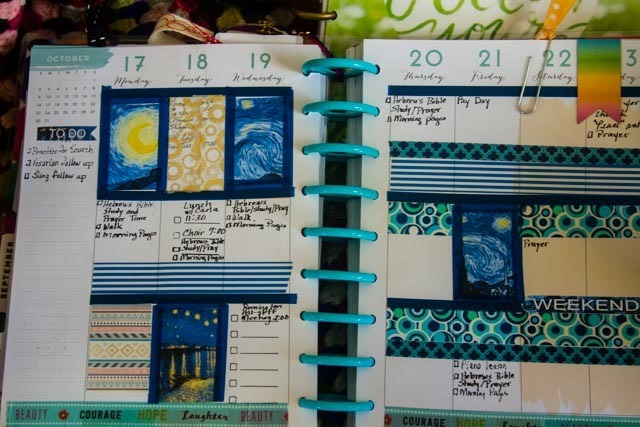 There are systems that use codes and symbols and colors. . . . And there are art-journal inspired planners (or unPlanners as one group calls them). Is it any wonder that I am a bit overwhelmed now with planning and trying to get my life organized? I have to admit, though, that I am caught up with the Happy Planner system produced by Me and My Big Ideas (MAMBI). here’s the story: I was a scrapbooker (and still am, though not as much as I used to be); I want to keep memories in some kind of way, whether through journaling or through scrapbooking or something else. However, now that my children are own their own, I do less scrapbook pages. I discovered, though that the Happy Planner is a convenient way to keep memories and do some planning and scheduling. It is becoming my way of keeping a record of life. I sometimes include photographs that are meaningful to that day. I punch holes in invitations that I want to keep, birth announcements, quote cards that I find, things like that. And you know what? I have a kind of scrapbook. I can look back and see what was important to me on a particular day or during a particular week or month. I can see what the important events were, like the days of Hurricane Matthew that created havoc for South Carolina’s coast or the church’s homecoming services and family reunions and my son’s band competitions. 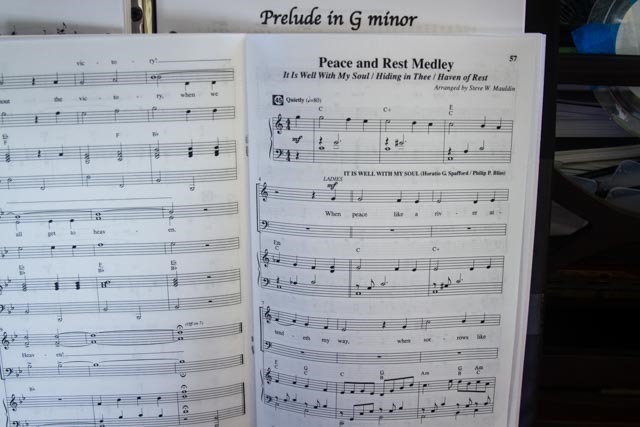 I can write ahead and put in future events—an upcoming bridal shower for my son’s fiancee, for instance, and keep track of the choir anthems that I need to learn. The main thing I’m learning about planning is that merely writing an event or a task down does not get it done. I list “photography” as one of my daily activities. (It’s almost noon and I haven’t picked up the camera yet! And I listed going for a walk as one of my activities for today, and I’m still in my pajamas. Nor have I yet practiced the anthem for Sunday morning, and we have choir rehearsal tomorrow night. I am using these planners, though, and someone in the future will have “fun” figuring out how I am through these little snippets of my days and weeks and months and years.